Cob is an ancient method of building with earth and straw or other natural fibers easy to find in the surrounding area. It is quite similar to the adobe one sees abroad, in that the basic mix of clay and sand is the same, but it usually has a higher percentage of long straw fibers mixed in. Instead of creating regular blocks to build with, cob is normally applied by hand in large gobs (or cobs) which can be easily handled during the construction process. The mixing of the the clay/sand/straw is with the bare feet; for this reason, it is fairly labour intensive. 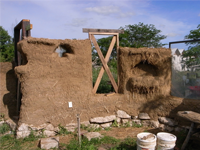 Because of all the straw, cob can be slightly more insulating than adobe, but it still would not make a very comfortable house in a climate of extreme temperatures. The wonderful thing about cob construction is that it can be a wildly freeform, sculptural affair. I've seen some very charming homes made this way. Cob was most common in England in the nineteenth century, and many of those buildings are still standing especially around Devon where new Cob houses are still being built by specialist cob experts. A variant of cob is what is commonly known as "light straw". This is made with the same long fibers of straw which are thrown into and worked through in a large vat. The idea is to coat the straw with enough of clay to get them to stick together, but not too much that it makes a gluey clump. Light straw walls could be useful for interior partitions and even exterior walls if it is thick enough. These walls would be more insulating than regular cob having a higher straw content, but they require a timber frame of some sort because the straw itself would not be load bearing.